BABY IN THE CAUL PICTURE!!!!! 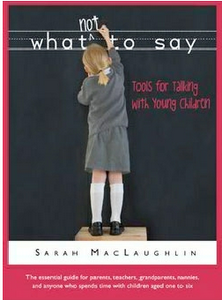 In this book, Sarah MacLaughlin has chapters dedicated to phrases to avoid and provides alternate wording to use instead. She has real life stories and situations to convey the message in an easy to follow and use way. At the end of different sections and points, she also provides you with a list of books you can read to your kids in order to help them out with communication as well. You will learn how to effectively speak with children to set limits, while maintaining respect for the child. You'll learn why threats, labels and confusing language can cause issues and what to say and do to avoid the pitfalls. There is SO much info packed into one tiny book. A very thorough arrangement of tips and more. All in all, this is an excellent resource it have in your arsenal if you have a small child. In fact, it might be a good idea to have anyone around your kid to read this book. Parents, teachers, grandparents, caregivers. The back of the book also has a nice list of books for parents to read as well, so, between that and the kids books listed...you should be set for a long while on learning for both you and your child. Also, be sure to enter at Sarah's site (http://sarahsbalancingact.blogspot.com/p/blog-tour.html) for the Grand Prize Giveaway: a Kindle Touch. Winner will be announced at the end of the tour after July 15th. WINNER HAS BEEN CHOSEN: Carmen!!! I have a 15 month old who is getting into everything these days and I really try to avoid saying "no" all the time. Instead I give an explanation and an alternative. For exaplme, he always goes straight for plugs when he sees them. So, I say "Danger!" And then give him a toy, book, etc. and say "this is safe to play with, let's play with this". Thanks for the great suggestions! "Danger" is a great alternative to "no." Sometimes, "Whoops, let's go do something else," is all it takes. I try hard to avoid saying 3 things - calm down, don't cry, and it's ok. Those are things that really make me more upset if I'm hurt or mad and they are said to me. Unfortunately sometimes it's the first thing to come out of my mouth but I'm working on it. I also love thE comment above me! We used the word danger when my daughter was smaller. Those are great ones too! The first two are in the book. When was the last time an adult calmed down after being told to calm down? Exactly, never! Don't cry and It's ok are such doozys too. Definitely not promoting emotional literacy with either of those. Sounds like a geat book not just for parents, but also for those who work with children. I've taught primary school in the past, and I'm now professional nanny. The phrases I try to avoid are 'Not now', 'in a minute', 'hang on', and the like. Those I just try to replace with my full attention, even if something else 'important' has to wait. I live in Holland, so there are a couple of very typically Dutch phrases I also avoid. 'Doe gewoon!' which means 'Act normal!' and is used all the time, when children are exhibiting any kind of behaviour which could be considered extreme, like crying, or arguing, or just playing very loudly and being boisterous. I prefer to just say what it is I'd like them to change about their behaviour, if anything. So... 'let's use inside voices', as an example. Another annoying Dutch phrase is 'Denk erom! 'said in a warning tone. It means 'Think about it!' and is used when a child is being naughty, or about to do something they shouldn't. I think it's a good idea to remind a child to think about their actions, but not in that way. There are nicer ways of putting it! Yes! The book is written for teachers, nannies, and others who interact with children. "Act normal" sure would sting--it implies that the child is not--how sad. It is always wise to ask for the bahavior you WANT as opposed to the behavior you want to STOP. As we say in social work: "you grow what you measure." Important to pay attention to what you are looking for. My guy is small, but I try to avoid telling him he's bad! I would much rather focus on the actual behavior. I have a two year old and I avoid asking him why he did something (in fact, I have told him to answer the question "Why did you do that?!" with "because I'm two!" which he does proudly.) Instead we focus on what the behavior was, what happened when it occurred, and what we could do in the future to avoid it. That is such great coaching. Age is often the reason kids do what they do--they're kids! Love that! I'm going to start using it whenever someone asks me why I do things! "Because I'm fifty-five!" Seriously, this is more than a great way to raise a child; it's a great way to interact with anyone! Of course, when you bring someone up learning how to interact this way (and by exclusion, how NOT to interact), you do create a better social world than the one you were born into. Instead if saying "no" so much I try to tell my one year old a positive action like go play with something else or come help me with __ activity I'm doing. I don't know how much it affects him yet but I know it sure helps my attitude! Framing things positively helps me stay calm and so of course he stays calm usually too! Yes, reframing is such a helpful tool!